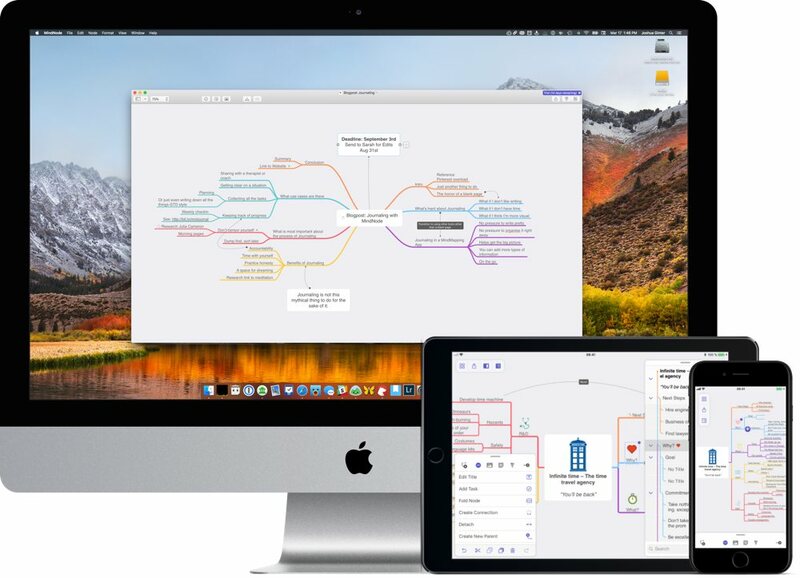 There are many very good options for mind mapping software to help you capture and organize your ideas, but we think that MindNode is the best for most people because it has a beautiful design, is easy to use, supports very reliable iCloud sync, and there are just enough import/export options to be a really useful tool in almost any workflow. What is a Mind Map, Anyway? A mind map is a diagram that connects information around a central topic or subject. The basic idea is that you start with a central idea and build branches (or “nodes”) around it. Think of it as the right-brained version of a standard outline which is perfect for “radiant thinking,” an idea popularized by Tony Buzan. (A mind map is) visually looking at ideas and their connections and relationships with each other. Note Taking: Mind maps offer a non-traditional and non-linear way to take notes in meetings or lectures, allowing you to make connections between separate thoughts and concepts more easily (especially if you use a digital tool that allows you to rearrange them). Brainstorming: One of the most popular applications of mind mapping is for brainstorming because it makes it easier to see the big picture. By escaping the traditional outline format, you’ll often find yourself “connecting the dots” in new and exciting ways. Writing: Mind maps are great for content creation (like when writing this article). We started with the topics and points of interest and fleshed out all the details, which made the process of writing the article much easier. Creating a mind map can help you overcome the fear of sitting down to an empty page as it provides direction and structure for knowing exactly what to write. Problem Solving: Mind maps can be a great way to solve problems because they allow you to analyze different parts of a complex problem to highlight new and creative solutions. As you write down different aspects of the problem and expand details where necessary, the answer often becomes clear. Book Summaries: One of the best ways to retain what you learn when reading a book is to write down the basic book structure in the form of a mind map. This also provides an easy way for you to review the information at a later date. 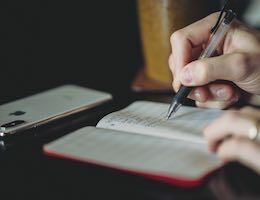 For example, you might not want to re-read the entire Getting Things Done book every year, but it can be helpful to at least review the core concepts to make sure there aren’t any glaring holes in your system. 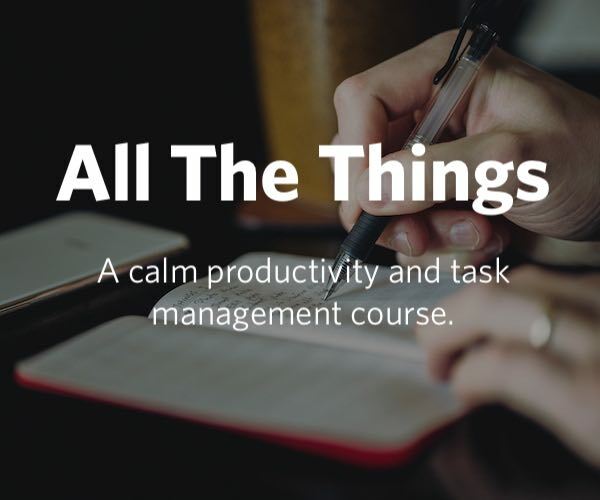 Project/Task Management: If you just can’t seem to make a task management system work for you, try using a mind map instead. Being able to visually see how your tasks are related might help you see your to-do list in a new light and help you get more done. Goal Setting: Setting goals is very powerful as it creates a plan and a vision for your week, month, year, etc. There are many books that talk about the importance of setting goals and making sure that you look at them regularly. Why not put those in a mind map that makes it easy see how everything ties and works together? Keep in mind that this is not a comprehensive list. There are many more use cases for mind maps, but hopefully you can start to see how useful they can be. One of the beautiful things about a mind map is its flexibility in application. There are many other options available, but these are the most popular or were the best fit for our selection criteria. Design: While appearance isn’t everything, it is important. Since mind mapping is a visual activity, the app has to look nice. If the app is designed well and the UI is nice, then the app will be a joy to use and you’ll find yourself mind mapping more often (which is a good thing). Ease of Use: Nothing disrupts the flow of creative juices quicker than having to consult a technical manual. The best mind mapping app is one that allows you to focus on the exercise of creating your mind map as the application fades into the background. It should be simple, intuitive, and user-friendly. 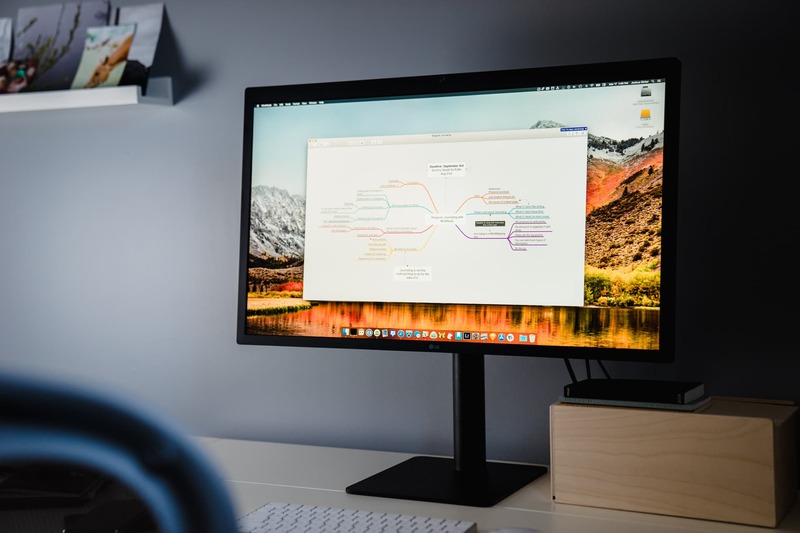 Syncing: Mind mapping is one of those activities you can do anytime, anywhere — unless the file you were working with doesn’t sync across platforms or devices. 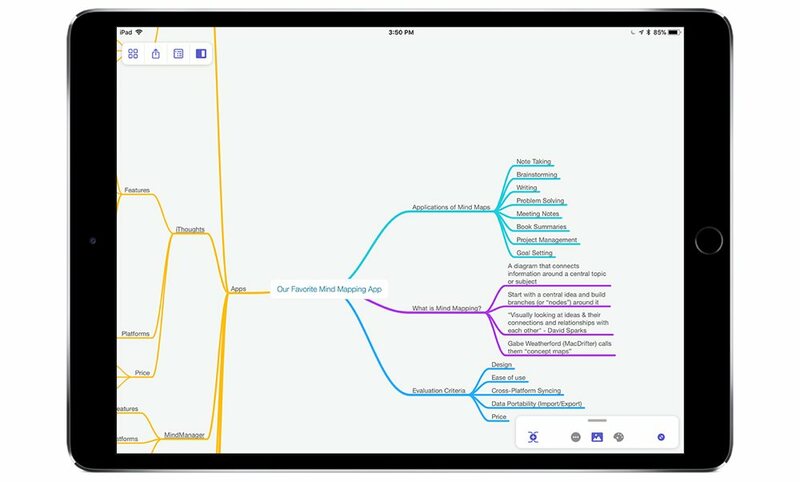 A good mind mapping app should allow you to start building your mind map on your Mac and pick up on your iOS device (or vice versa). Data Portability: Mind mapping is usually where ideas start, but seldom where they end. It’s important that a mind mapping app have support for import/export options so you can easily translate your ideas to another tool in your workflow. Price: This isn’t weighted too heavily, but because the options that are available range from free to almost $500, it does have to be taken into consideration when you’re considering the value of the application you’re spending your hard-earned money on. 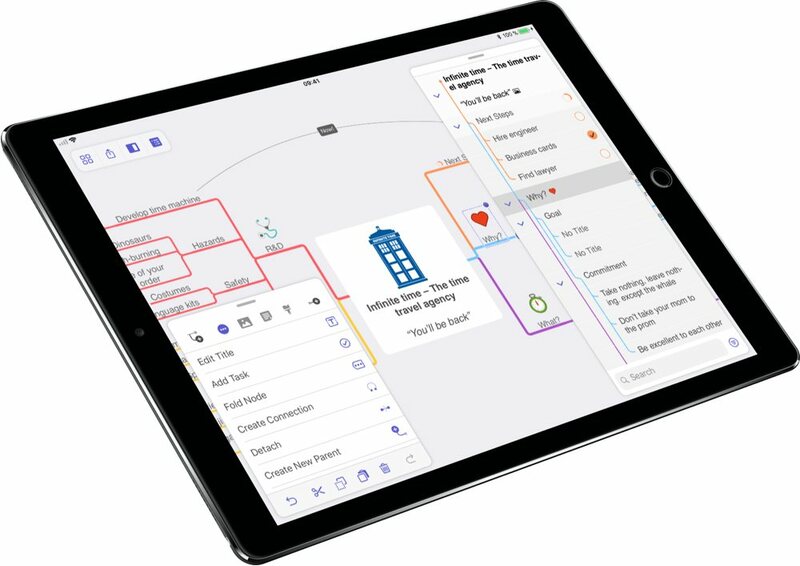 MindNode has the perfect balance between beautiful design, ease of use, standard features like iCloud syncing between your Mac and iOS devices, and import/export features to make it a functional part of any workflow. 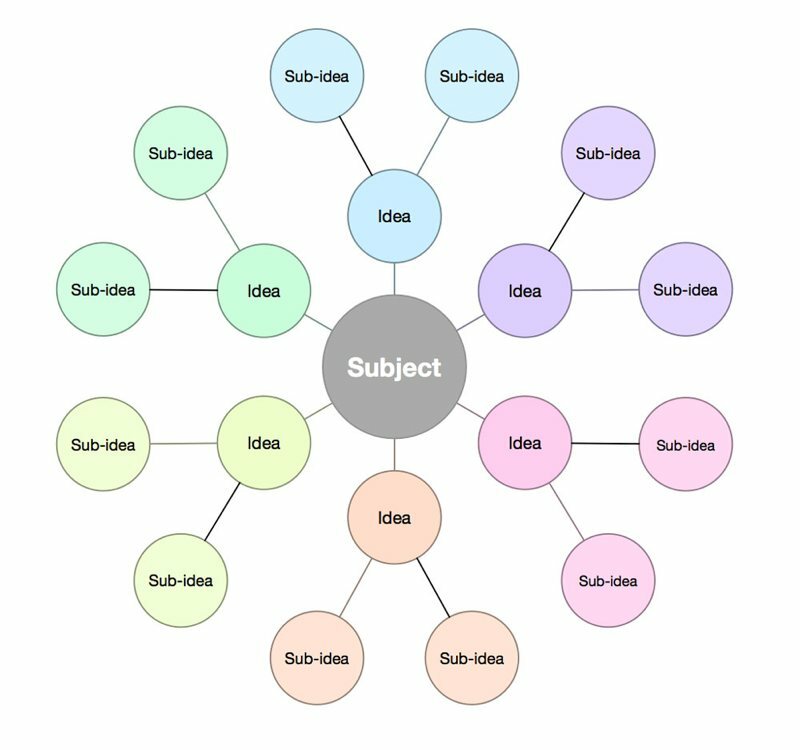 The text is even selected in the central topic node for you, so all you have to do in order to start making a mind map in MindNode is start typing. Once you get your central topic down, just click the “plus” button (or hit the Tab key) and a new child node is created. When you add child nodes, the application uses a smart layout feature to automatically rearrange your nodes so that they’re spaced appropriately and you can still read everything. You can even attach files to nodes in MindNode by simply dragging them over the node. This can be really useful when you want to refer to files on your Mac from your mind map without having to search or navigate through the Finder to locate the file. MindNode lets you clean things up with the ability to “fold” nodes. You can do this by right-clicking on the node and selecting Fold Nodes, selecting Fold Nodes from the Node menu, or by holding the option key and clicking the plus button (it will change to an ellipsis, or three small dots). When you fold a node, all of its child nodes become hidden; when you unfold it, they all return to their original location. This allows you to get a high-level overview without getting into the minute details of your mind map. This is a great feature and one of the key benefits of using a mind mapping app instead of mind mapping on paper. A digital mind map is much more flexible and gives you many more options in terms of layout. 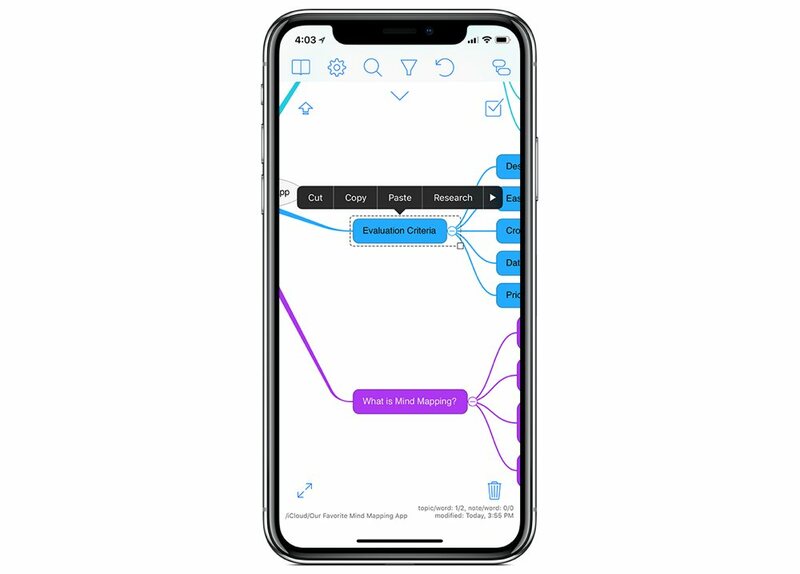 For example, in MindNode Pro you can even detach nodes or files if you’re not exactly sure where they belong, then just drag onto the parent node as things start to come together and those connections will be made automatically for you. You can even make additional external connections between nodes with different parents if you really want to tie things together. There’s even an outline mode in MindNode. It’s read-only, but it allows you to see your mind map in a traditional outline format if that’s your thing. And, if you’re more comfortable working on a keyboard, MindNode supports a ton of keyboard shortcuts on both Mac and iOS. MindNode version 5 is a substantial upgrade to previous versions, but you may not notice it right away. Much of the design and layout has been completely revamped to make it easier to use and improve discoverability of important features. For example, let’s use the hyperlink example from earlier. If you’re familiar with MindNode version 4, you might have tried to find this in the old Inspector window. But with version 5, the inspector has been split in two with both a Style Inspector and a Notes Inspector and the link feature is nowhere to be found in either of them (but you can still access it via the user interface by right-clicking on the node and selecting Show Notes Popover). Instead, adding a link uses the same keyboard shortcut (⌘K) you would use in a Markdown or code editor. The goal is to make sure that important actions like this are now no longer hidden away in the sidebar, and while it may take a little bit for MindNode veterans to get used to, we think it largely works as everything is well thought-out. It’s surprising how many aspects of the user interface were updated to give the app a fresh new look and feel. All UI icons and stickers were also updated in an all new style that feels fresh and clean, and you can now customize the toolbar to better suit your needs if you’d like. 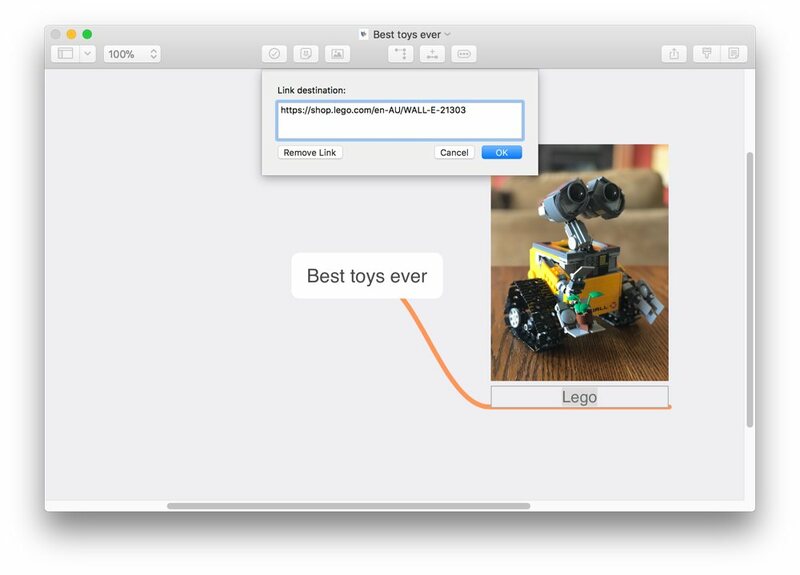 One of the major new features of MindNode 5 is Quick Entry, which acts as a menu bar application. This is a surprisingly useful feature allowing you to jot down notes while using your Mac and turn them into a mind map later with the click of a button. You can even add tasks or notes in the Quick Entry interface. There are several other small improvements that improve upon the solid user experience in version 4, like additional themes (you can even create custom themes) if you wanted to change how MindNode looked and orthogonal branches to give your mind maps a more edgy feel. You can also now have both the outline view and the inspector open at the same time as the outline has been moved to the left side of the interface. MindNode offers rock solid (in our testing) iCloud sync with the iOS version. iCloud had some struggles initially, but it’s improved quite a bit over the years and has evolved into a very solid sync platform. We encountered no problems in our tests with MindNode. 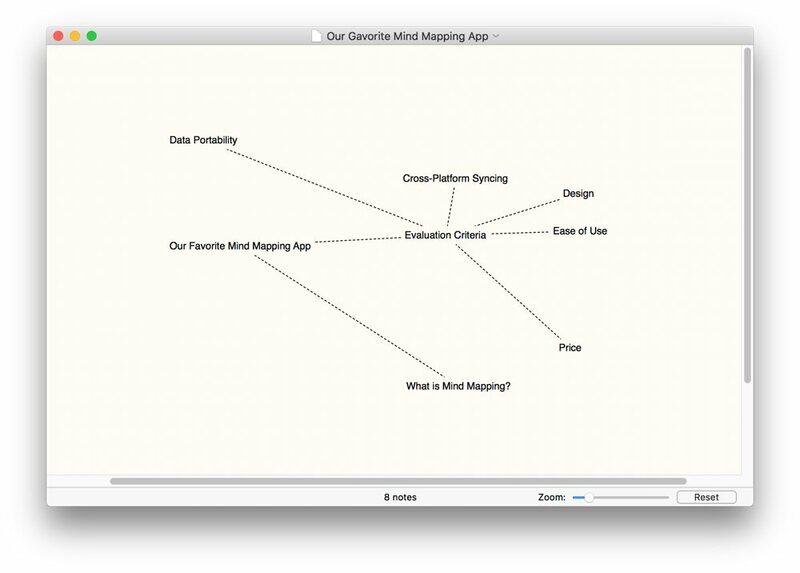 The iOS version of MindNode is also very clean, beautiful, and easy to use. And with version 5, the iOS version has near feature parity with the macOS version so you can work on your mind map just about anywhere. Even the Quick Entry feature has made it into the iOS version, but that doesn’t mean that the interface is cluttered as the iOS interface has been reengineered for the smaller screen size. 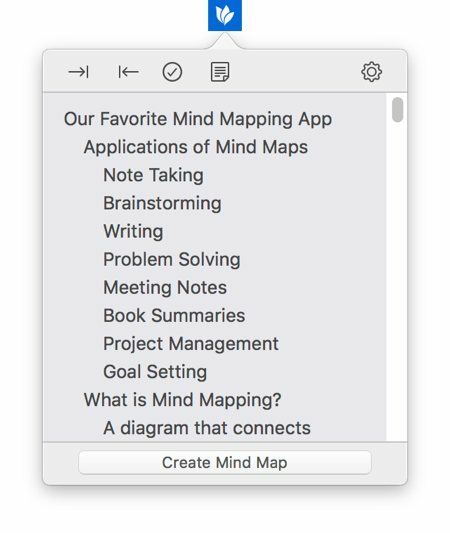 While the Mac version has a slim toolbar across the top of your mind map file, the iOS version uses a couple of buttons and a swipe-up panel to access many of MindNode’s features. The end result is that it is incredibly easy to access and edit your mind map, even on the limited screen real estate of an iPhone. On the larger screen of an iPad, MindNode 5 for iOS really shines. In fact, mind mapping on an iPad is sometimes even easier than on the Mac because you can just drag nodes around with your finger on screen. David Sparks and Katie Floyd talked about mind mapping in Episode 82 of Mac Power Users, and David talked for quite a while about how mind mapping on an iPad just “feels right” (and in our experience, we tend to agree with him). 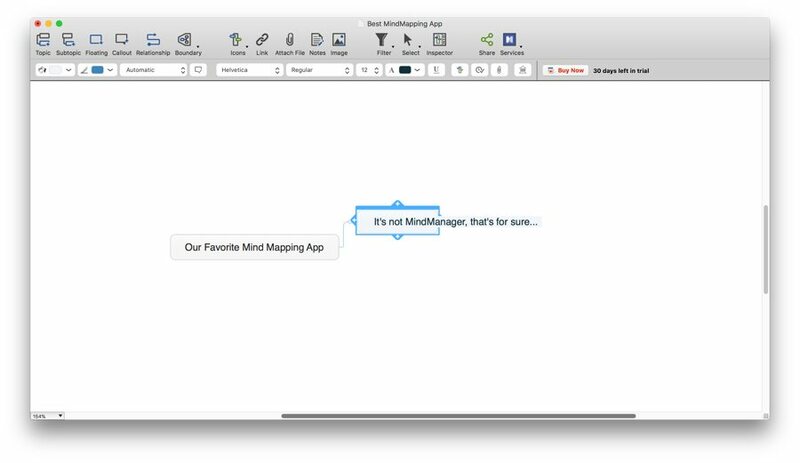 MindNode also has some cool sharing features, including sharing to “MyMindNode,” which uploads your mind map to the MyMindNode service and creates a unique URL that allows you to open the mind map in a browser. You can even get a customized embed code to publish the mind map in a webpage if you’d like. When you share a mind map from MindNode to Things 3, you’ll get a new project in Things that inherits the MindNode document name as its title. Within the project, the outermost leaves of a branch become individual tasks, and intermediary nodes become project headings with simple text breadcrumbs to indicate further hierarchy. It’s an elegant representation of the data, and the implementation is thoughtful. 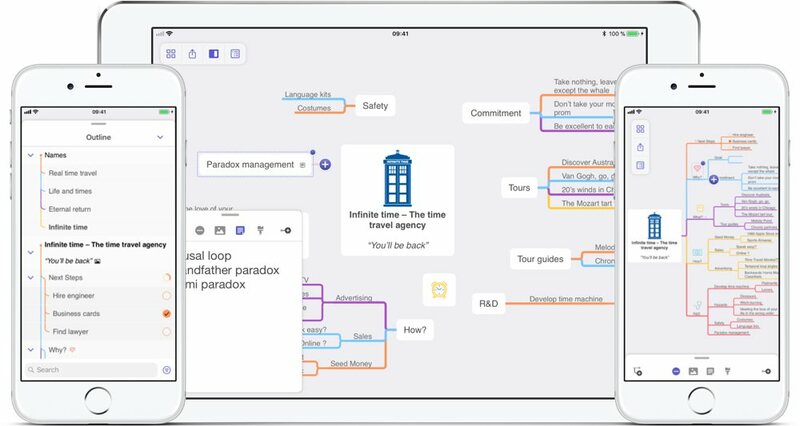 Notes attached to your nodes are brought over as notes attached to the resulting tasks in Things, and the project itself gets a deep link within its notes field that returns you to the mind map with a single tap, on macOS or iOS, using MindNode’s own URL scheme. It’s important to note that all this is one-way: it’s an export system, not a synced integration. You must also explicitly set the outermost leaves as task type nodes in MindNode before it will let you export the project to Things — a step that makes sense semantically but is probably unnecessary. You can also share mind maps in a variety of places through the Share extension. OPML: This is probably the most important one, as it allows you to take an outline from a standard outlining application (like OmniOutliner) and import it as a mind map. OPML is a fairly standard format, so support for this file type is essential. 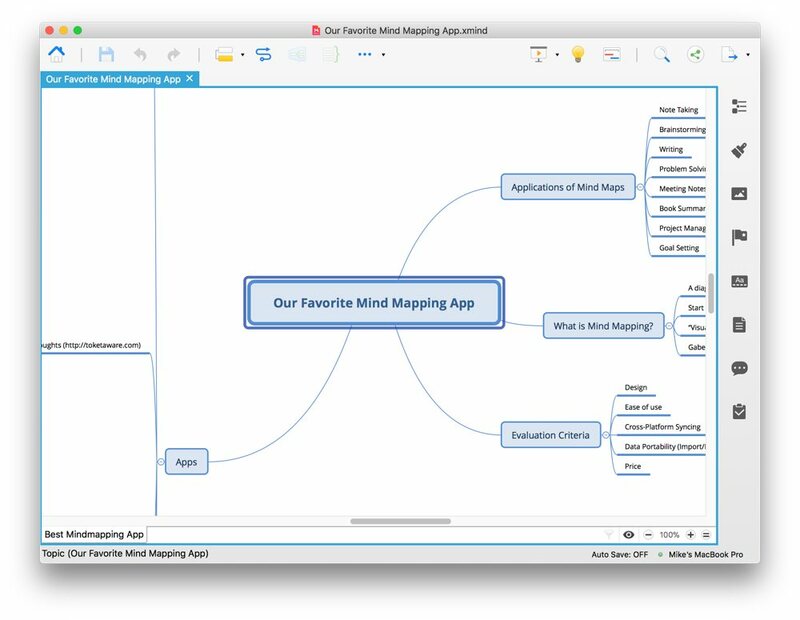 FreeMind: FreeMind is a free mind mapping application built on the Java framework for both Mac and Windows that has been around for awhile, and MindNode can both import and export FreeMind files if you need to work with someone else who uses this format. CSV: The format supported by most spreadsheet applications, and MindNode allows you to both import from and export to CSV files. 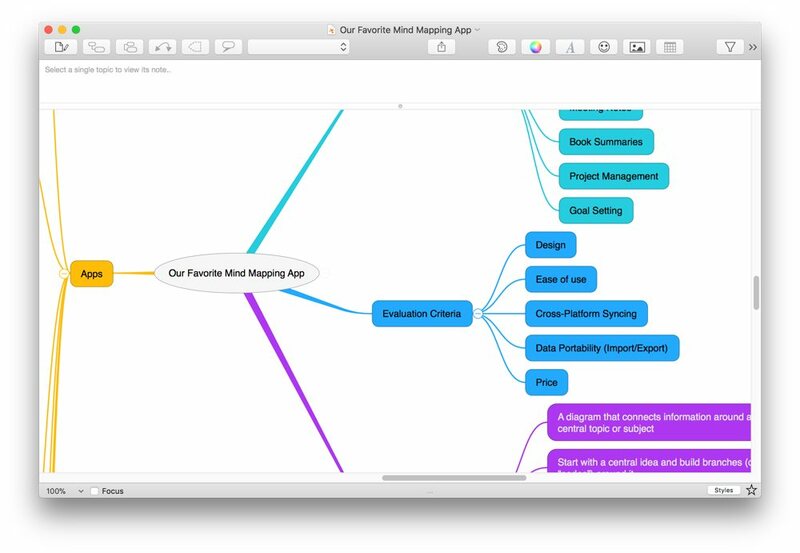 Plain Text: If you like the concept of mind mapping but work with outliners, MindNode allows you to export your mind map in a format that they’ll easily understand. iThoughts (import only): You can import your mind maps from this popular mind mapping application. Mindjet MindManager (import only): If you received a mind map file in the MindManager format (seems to be more common in corporate settings because of MindManager’s high price tag), you can import it into MindNode. PNG (export only): MindNode also allows you to export your entire mind map as a PNG image file. PDF (export only): PDFs are a standard file format that is great for archival, and MindNode allows you to export as PDF as well. 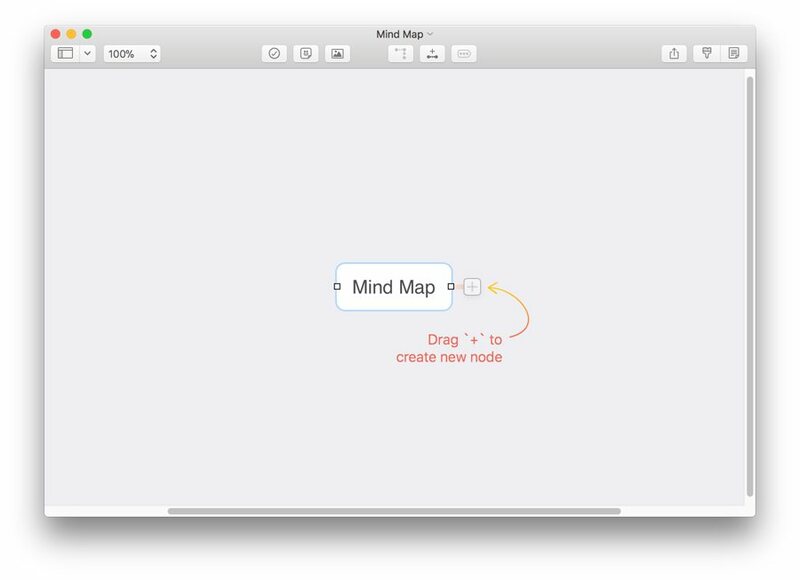 MindNode is available as a native Mac app for $39.99, and the iOS version is available as a universal app for $14.99. You can download the apps for free from their respective App Stores to try them before you buy, and both include a free 2-week trial of the additional features before deciding on the in-app purchase. 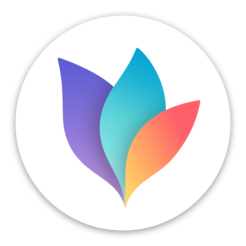 And if you’re a previous MindNode user, there’s special upgrade pricing available for both the Mac and iOS versions (details for upgrading are available on the developer’s website). If you find yourself needing a bit more from your mind mapping application, iThoughts could be for you. 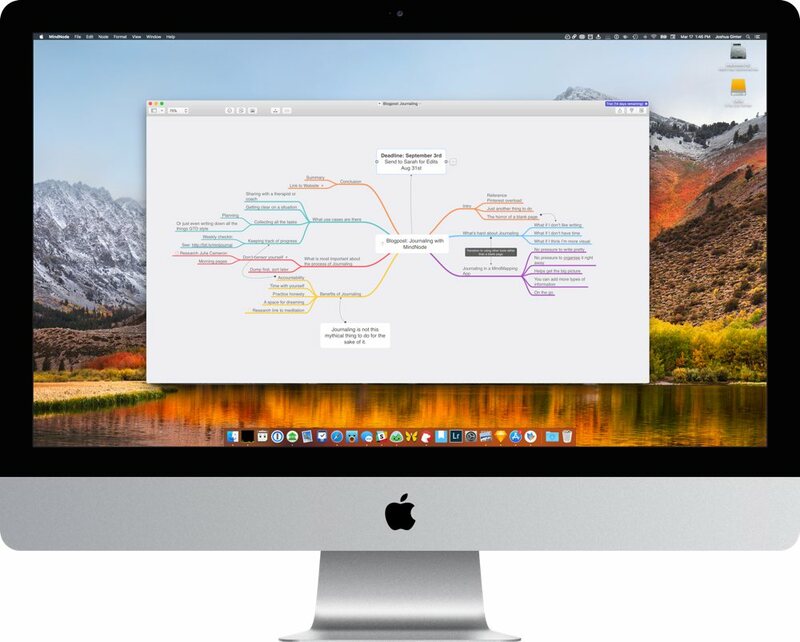 It’s not as easy to use as MindNode and the interface doesn’t look quite as nice, but it has some really powerful additional features that can take your mind mapping game to the next level. One example of these additional features is that you can actually edit your mind maps in iThoughts via Markdown through the Marked 2 app integration. We’re big fans of Markdown here at The Sweet Setup, and we think the ability to edit mind maps in Markdown is pretty cool. By opening the same mind map file in both iThoughts and Marked 2, you can edit your mind map in real-time using Markdown in Marked 2 and see your changes displayed in real-time in iThoughts. You can also create mind maps using your voice with Siri dictation with the iOS version of iThoughts. To distinguish between different nodes, just say “comma” after each node. David Sparks [wrote about this a while back](http://macsparky.com/blog/2011/12/16/mind map-with-your-voice.html), and his post includes a video by the developer showing this feature in action. If flexibility with different files types is important to you, than iThoughts is a great option. The developer has done a great job of adapting the iOS version to take advantage of the touch interface, making it easy to use, but that doesn’t mean the application is stripped of any of its power. For example, there’s an integrated browser you can use for in-app research so you don’t have to switch back and forth from iThoughts to Safari. This is really handy as it keeps all your links right inside the app and adds them to your mind map automatically. In fact, all you have to do is select a node and press Research in the contextual menu and the in-app browser will open and do an internet search for the term from the node. Like MindNode, iThoughts also supports a ton of keyboard shortcuts. There’s also an iOS presentation mode for presenting your mind maps on an external display (either VGA or AirPlay). Another power user feature is x-callback URL support. This allows it to integrate with powerful iOS automation apps like Launch Center Pro, Drafts, Workflow, and Editorial. The developer has a page that explains how to use it with iThoughts, but if you don’t know what that is then you definitely don’t need it. iThoughts also has a bunch of other awesome features like versioning support, so if you make edits and realize that you made a mistake, you can go back and restore to a previous version. It is also extremely customizable, letting you tweak just about everything in the application like colors, fonts, text size, etc. (iThoughts calls these styles). Once you get everything just the way you like it, you can share your custom styles through email with colleagues or friends. 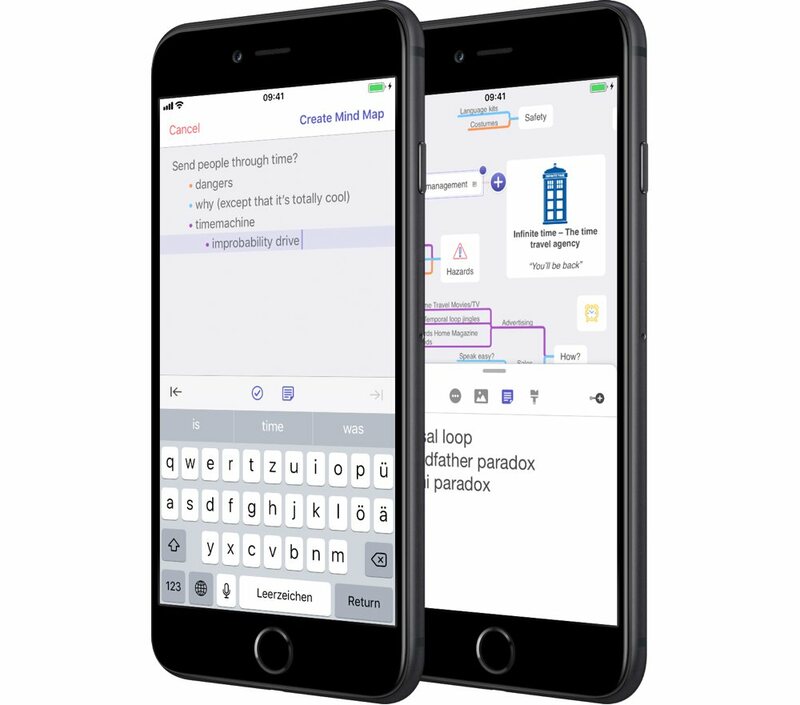 Just like MindNode, iThoughts has seen the addition of several additional features, including updates for iOS 11 and Drag-and-Drop. The iOS version integrates with the native Share sheet, there are Topic count tooltips that allow you to quickly count up the number of descendent topics, and even a new Windows version. But one of the most notable additions is the not a feature in the application itself, but the inclusion of iThoughts as part of the SetApp service. It you’re not familiar with SetApp, it’s like Netflix for quality Mac apps, giving you access to many fine applications (like Ulysses, 2Do, iStat Menus, and many more) for one monthly cost of $9.99. If you don’t like the idea of subscription software, you can always buy iThoughts outright. It’s available on the Mac (iThoughtsX) for $49.99 and a universal iOS app (iThoughts) for $11.99. MindManager has been around for a long time and has long been considered the go-to power user app. It’s supported a lot of standard features longer than most of the other apps on the list have been around, but it’s also VERY expensive and, frankly, the extra cost isn’t justified in our opinion (the standard version is $349, while the Mac version is $179). The Mac version also lags in development, which is reflected in the price being almost half of MindManager 2018 (the current version as of this writing). In fact, it’s still on version 10, which is the same major version that was available when the first version of this article was published — in 2015! To be fair, MindManager has a lot of exclusive features — we just don’t think they’re useful enough to justify such a steep price, especially when considering our evaluation criteria and the quality of the other apps that are available. If you really want to make your mind maps do some crazy stuff (like have multiple links in a topic, link in a database, etc.) then maybe it’s for you. Their focus is primarily on the Windows-using corporate users, and the Mac version hasn’t been updated in several years. It’s worth mentioning here only so that you don’t make the mistake of investing in it. XMind: Zen: Subscription-based app for personal use, which is $27.99 for 6 months. XMind Pro: Geared towards corporate users, which is a $129.00 one-time purchase. The Pro version includes features that didn’t make our list of criteria for what’s important (like the ability to use Gantt charts), but for certain users they could prove useful. XMind is a decent application, but there’s nothing that really sets it apart according to our selection criteria and is very expensive if you decide to buy it outright. $27.99 for a 6-month subscription is not a small chunk of change, and that doesn’t include the separate subscription for iOS ($9.99 for 6 months). Although you can buy both together for a discounted rate of $29.99 every 6 months, the pricing is still way too high (and can be very confusing). XMind is available through SetApp, however. So if you already have a SetApp subscription, you may as well give XMind a shot and see how it compares to iThoughts. 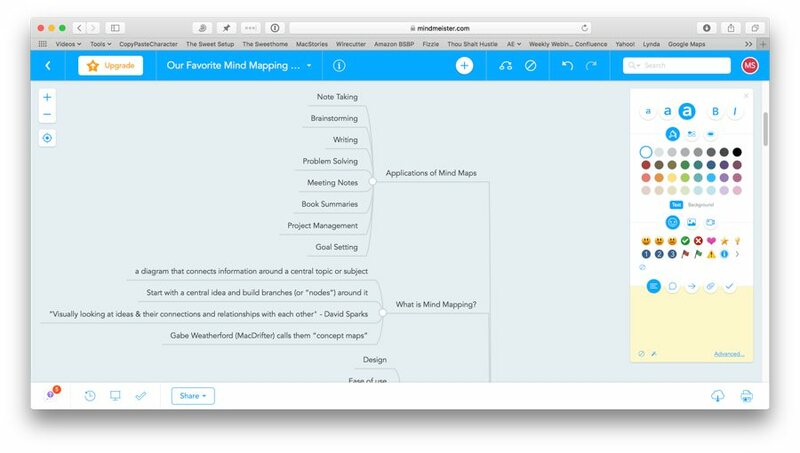 MindMeister is a web-based mind mapping app that aims to alleviate the difficulty of collaborative mind mapping. It has a really cool “Opinions” feature that allows collaborators to vote “yay” or “nay” to individual nodes in your shared mind map. It also has some cool integrations, like a Google Docs add-on and even an integration to [turn your mind maps into agile projects](http://www.mindmeister.com/blog/2015/03/18/this-tool-turns-your-mind maps-into-agile-projects/), if that’s your thing. MindMeister offers several different plans, including a free basic plan with support for up to 3 mind maps at no cost. You can upgrade to a Personal plan ($4.99 per month) that lifts the 3 mind map limit and also gives you a bunch of additional features, or a Pro plan ($8.25 per user per month) that gives you multiple users in a team as well as custom themes and branding. There’s also a business plan ($12.49 per user per month), which gives you multiple admins, custom domains, and group sharing. If you find yourself needing to collaborate with others on a mind map, definitely check out MindMeister. 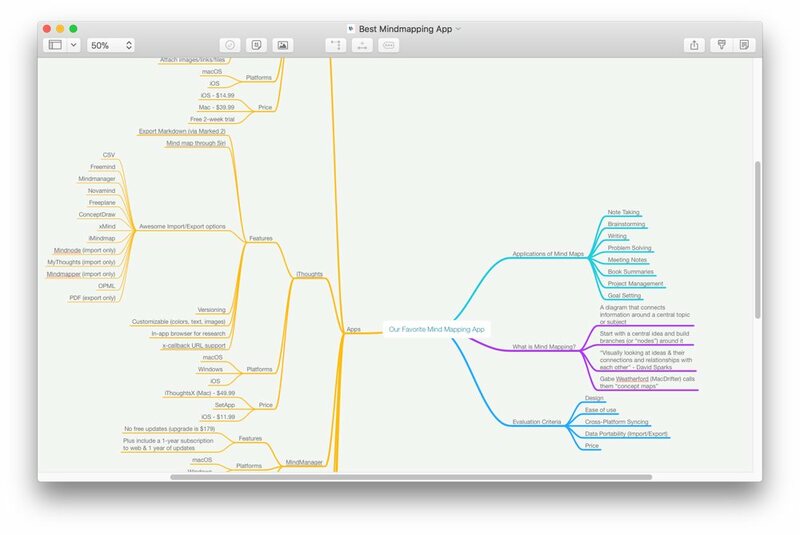 For individual mind mapping, MindMesiter just isn’t as polished as either MindNode or iThoughts. Scapple is interesting because it has a little bit of a different take on mind mapping. Instead of starting in the middle with a central topic, Scapple allows you to put nodes anywhere on the page without making connections so you can just get everything on the page and then figure out how it all ties together later. In Scapple, you double-click to add a free standing node and then drag it on to another node to make a connection. This approach is more flexible and lends itself better to creating “concept maps,” which are basically mind maps with more than one central topic. If you’re into free-style mind mapping, Scapple may be for you. Scapple is available for both Mac and Windows and is $14.99. It’s developed by Literature and Latte (the makers of Scrivener), so it integrates very nicely with Scrivener for large writing projects as well. In fact, all you have to do is drag your Scapple file into Scrivener and it will organize everything for you. In short, MindNode is going to be perfect for about 95% of people. It has a gorgeous UI, is extremely easy to use, syncs well between mac and iOS, and has enough import/export options to be really useful. The price point is also very fair. For power users who really like to make their software dance, iThoughts is the logical step up. It offers some really cool features like editing in Markdown and x-callback URL support. And, if you need to collaborate with others, MindMeister is a great (albeit limited) web-based option.